Halo has been one of the defining franchises of video games for more than a decade now. The Master Chief Collection brings four blockbusters from Microsoft's flagship franchise to the Xbox One in all their glory. In addition to a fully remastered Halo 2 campaign, Master chief collection brings 2011's remastering of the first game, Halo: Combat Evolved Anniversary and both Halo 3 and Halo 4 to the Xbox One in 1080p at 60 FPS. And if that wasn't enough, 343 Industries also crammed in the original multiplayer experience from each title as well as a new Halo 2: Anniversary multiplayer. The main selling point of The Master Chief Collection is, of course, the full HD remastering of Halo 2. Where Halo: Combat Evolved Anniversary was great, Halo 2 Anniversary is miles ahead. The graphics look absolutely gorgeous and take full advantage of the Xbox One hardware. With the ability to switch between the original graphics and the new ones at-will you can really see just how far Halo has come. The game plays just like the original but looks and sounds so much better. Beyond the brand new graphics, Halo 2: Anniversary also features brand new re-imagined cutscenes created by Blur Studios. These are some of the prettiest cutscenes I've seen in a video game. The game also features remastered audio. All the guns sound like they pack so much punch and there is just so much more ambient noise to set the tone. Halo 2's soundtrack has also been completely rerecorded and it sounds amazing. Halo: Combat Evolved Anniversary recieved the same treatment but it is so much more evident this time around. The new music sounds amazing and, quite frankly, is what the original soundtrack should have been. My one gripe is that they removed the original tracks by Incubus and Breaking Benjamin that appeared in the game, but they did replace them with some pretty sweet new rock and metal tracks. Halo: Combat Evolved Anniversary, Halo 3, and Halo 4 all look fantastic in their new higher resolutions and frame rates. The detail is much sharper and they move so smooth. It is most apparent for Halo 4 which looks even more amazing than it did on the 360. Beyond simply looking better, the increased frame rate makes the gameplay so much smoother for all three titles. 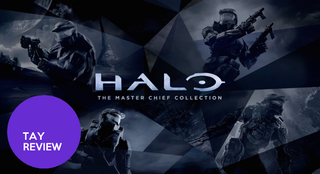 The Master Chief Collection features the original multiplayer experiences from Halo: CE, Halo 2, Halo 3, and Halo 4, as well as a brand new Halo 2: Anniversary multiplayer. You can play a wide range of playlists, both specific to each game and across multiple titles. You can play on every single map ever released for the four titles included as well as six remastered Halo 2 maps. Halo has always been about great arena-style combat and with The Master Chief Collection, you get to experience all of it and relive your fond memories of playing them or check out the ones you missed out on. The Master Chief Collection features campaign playlists for each individual game and across all four. These playlists include challenges such as the full "Legendary All Skulls On" campaign, or all the missions with vehicles, or all the final missions. These are fun subsets of the Halo campaign experience that are worth checking out. The Master Chief Collection has a lot of achievements. I'm not even kidding. There is a full game's worth of achievements for each game and then some. There's over 4000 gamerscore to be earned in total. The achievements range from trivially easy like completing a mission, to super tough challenges like completing a LASO run of all four games, to weird and fun nods to Halo's past. The one major flaw of The Master Chief Collection is the broken matchmaking. At launch it was almost impossible to find a game and when you finally managed to it would more often than not lose the connection. It has been two weeks since launch and even after one patch, players are still having issues connecting. There is no excuse for this to still be an issue this long after launch. These issues absolutely need to be fixed as soon as possible. Despite the matchmaking issues, Halo: The Master Chief Collection is definitely worth it. This is essentially four games and then some for the price of one. If you're a Halo fan you would be crazy not to pick this game up. If you missed out on the older games and want to know what all the fuss is about or are a longtime veteran and just want to be able to play the games again, then this is the game for you.